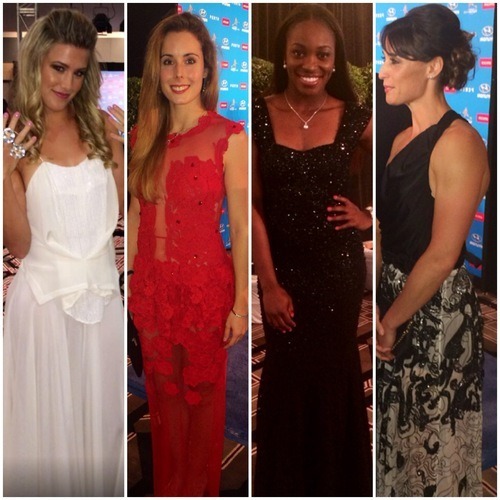 The New Years Eve, Hopman Cup Ball, at the Crown Casino, is an annual Gala event! International sporting celebs mix ‘n mingle with Perthites, Fashionistas and Media celebs, to welcome the New Year in, in style. 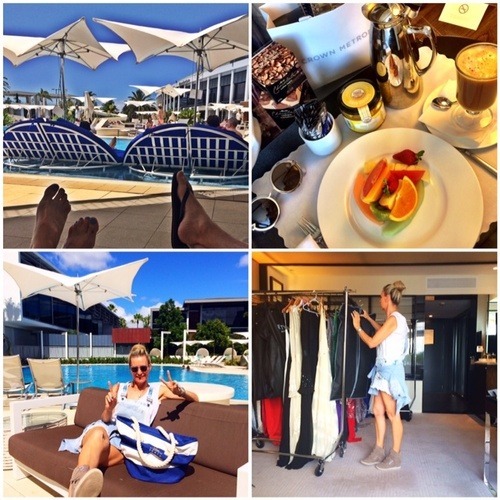 WA’s Perth Fashion Festival, has an International Programme and invited me to be involved with the styling of the International players for the Ball. As I’m a tennis nut from way back, I thought it would be a fun thing to do! Prep started early in December. Always good to plan ahead!! 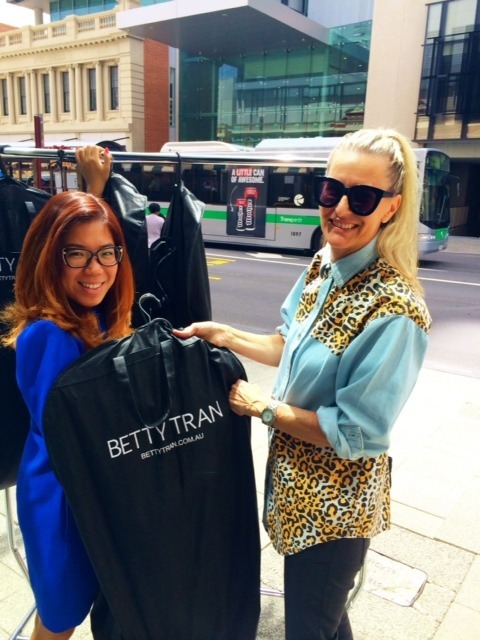 The ball would be a perfect opportunity to showcase our amazing WA designers to the world. 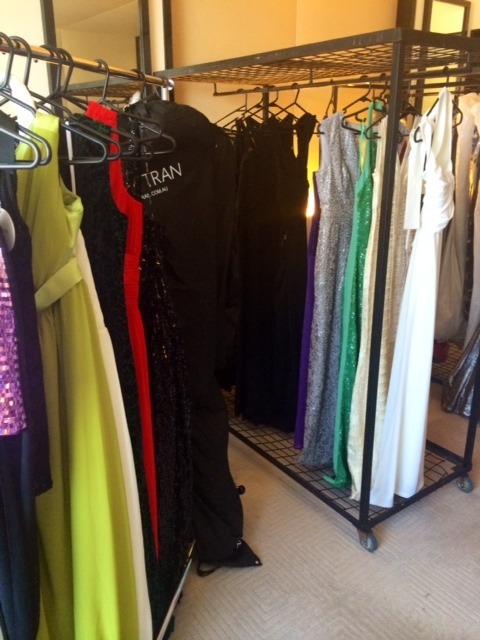 Visiting stores, studios and warehouses, I selected gowns, shoes, gowns and more gowns (varying in size from 8-14) and stored them safely, well in advance of the big event. The players were all staying at the Crown. So, I set up a ‘Pop-Up’ gown store in a suite at the Crown. This meant, in between training and matches, the players could book in for a private viewing and fitting. Gowns from WA Designers such as Steph Audino, One Fell Swoop, Empire Rose, Jomay Cao, Ruth Tarvydas, Ae’lkemi, Flannel and Betty Tran were on display. Zu kindly donated 10 pairs glitzy, sky high ball shoes! WooHoo!!! Over several days, the players came in one by one. They were really friendly, excited and simply delightful to style. 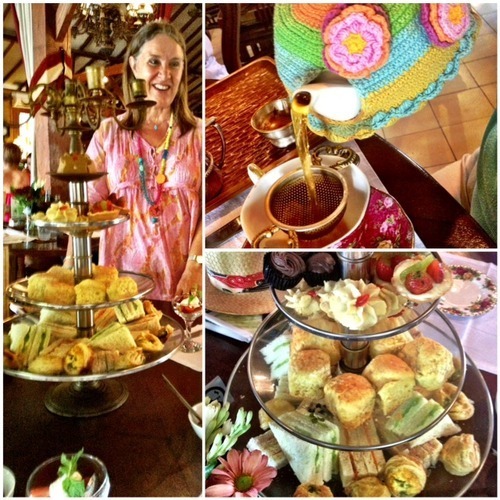 Some, stayed for an hour or more… happily swapping leggings and singlets for girlie gowns. Others sped in, tried on one gown only and happily left! 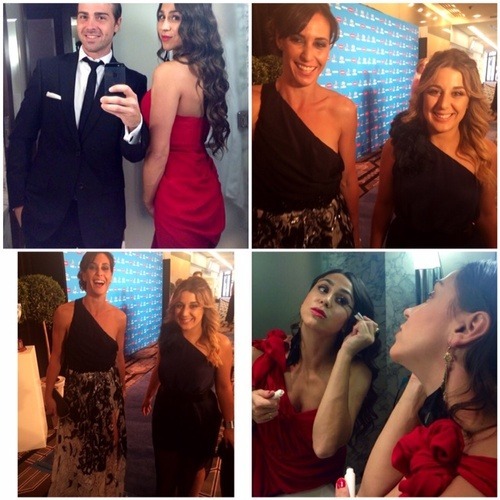 Pictured above (R) with Italian Tennis Star, Flavia Pennetta and (L) with French player Alize Cornet. The ‘Before’ hair and make-up snapshots above, show how natural and down to earth these sporty goddesses were!! 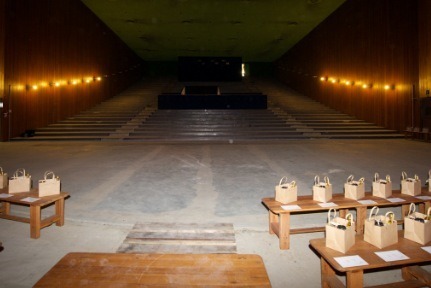 …Cant wait to show you the ‘After’ results. In between the styling bookings, there was a teensy bit of R&R time to take a breather and enjoy all that the fabulous Crown has to offer. 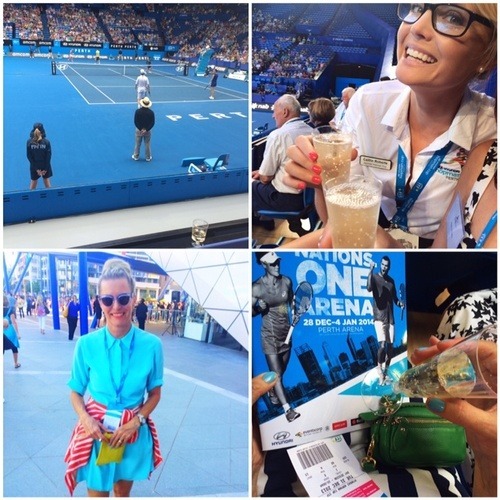 Once all the styling prep was done, there was also time time pop over to the Perth Arena to watch some exciting tennis! 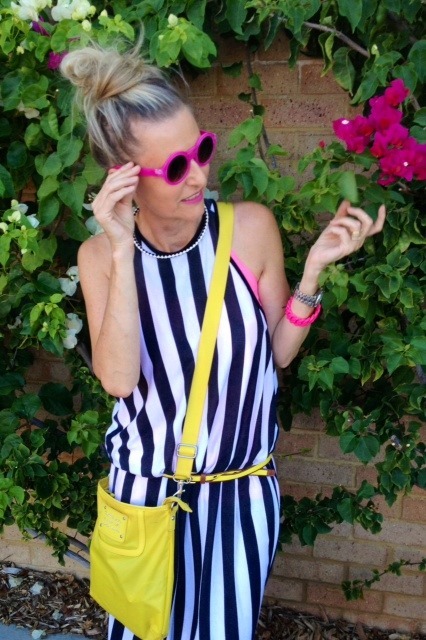 Attending the tennis as a guest in both the Hawaiian Suite and also the Perth Fashion Festival Box were personal highlights. As the Ball grew closer, the players (and some of their mums and partners) were pampered at the Crown with glam hairdos from Loreal, make-up by Lauren Wood and complimentary jewellery for the night, from Solid Gold Jewellers. 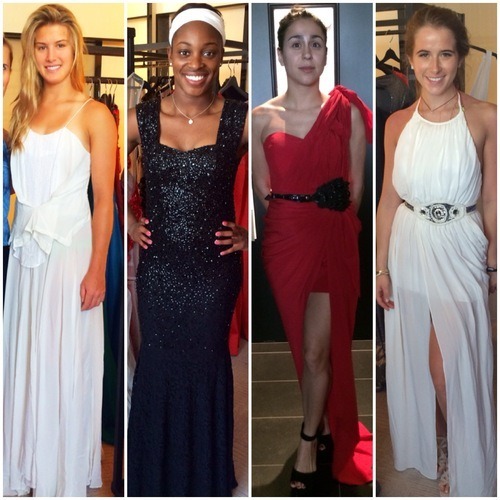 The players were all set and ready to swap tennis balls for ballgowns!! As they arrived and walked the ‘blue carpet’ for press shots, I stood aside at the end of the runway to take a few AndAndrea snaps. (L-R) Eugenie in One Fell Swoop, Alize in racey, red Ruth Tarvydas, Sloane in black Betty Tran sequins and Flavia in Steph Audino. Canadian star, Eugenie Bouchard (R) wore an ivory, sequined, One Fell Swoop gown, whilst Julie (her mum) stunned the crowd in a draped Steph Audino magenta gown and Zu heels. 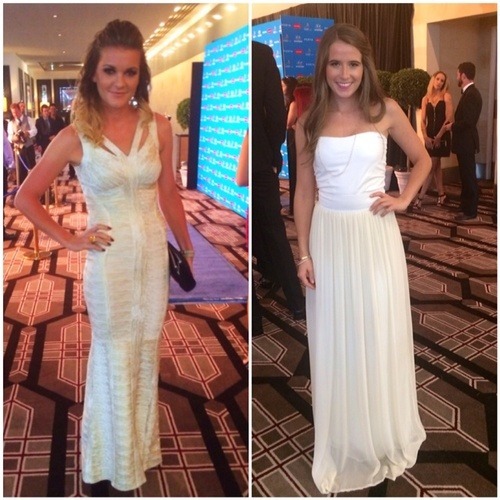 Flavia and Lucia (both seen above, in the ‘Before’ shots) chose Steph Audino gowns. They were thrilled to meet the designer herself, Steph Audino on the night. Aga Radwanska (L) wore a gold fleck Jomay Cao gown. Maddy McKinley (R/John Isner’s girlfriend) chose a leather/silk Flannel gown which was later gifted to her by Kristy from Flannel. I’m not a ‘Baller’ and opted for a quiet NYE. 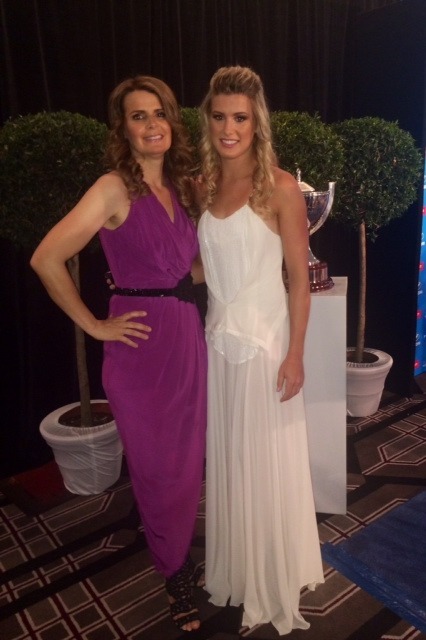 So I didnt doll up for the ball, but did quickly pull on my Scanlan maxi for a photo with gorgeous Eugenie. 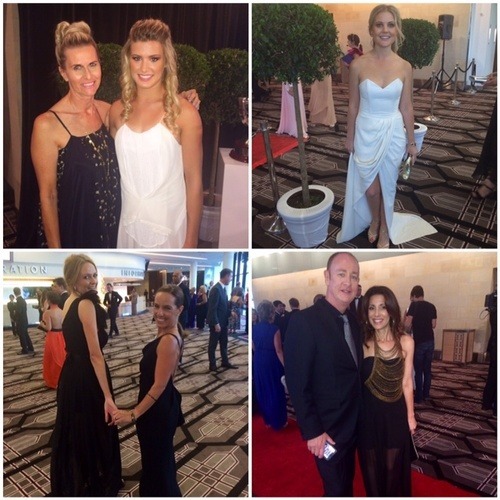 Hopman organisers Libby and Julia, as well as PFF’s Mariella (above) all rocked Steph Audino gowns. In a flash, the Ball was over and the unworn gowns were returned back to the designers. It was a fabulous event and a night for WA Designers to shine!